This week's post is dedicated to Pigasister Victoria's husband Austin! 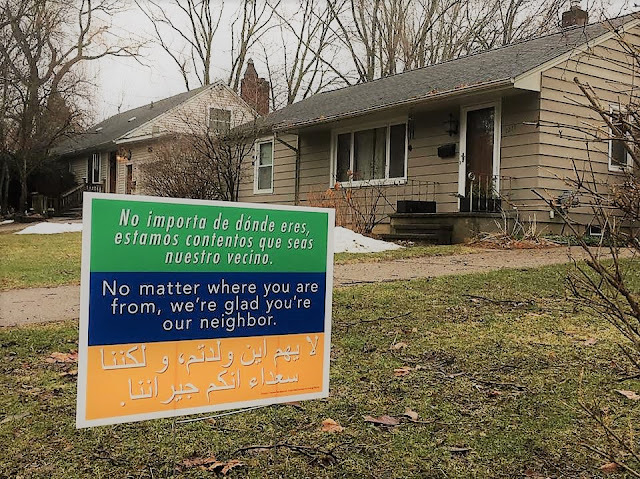 This winter, Austin used one simple sentence (in three languages) to give his entire neighborhood a makeover, and the message of welcome is spreading all over the capital city area--and communities elsewhere in the United States. Austin and another member of our church, Mary Elaine, have teamed up to get hundreds of these signs printed, and they are selling them at the church during coffee hour. Already, we've heard many stories of people jogging or walking in the neighborhood, turning a corner, and seeing rows of these colorful signs speaking words of welcome to them in their language of origin and moving them to tears. These signs are crossing political divides, uniting political conservatives and liberals who wish to break the silence on our shared support for our local refugees and college town immigrants who contribute so much to our lives and our cities--and who are simply human beings worthy of living in peace among us, regardless of the political climate. You can read more about Austin's sign campaign in the news here, and if you are not living in the Lansing area, you can order your own yard sign online here.